Overview | The Generation After, Inc.
Generation After Board Member Michlean Amir, Reference Coordinator of the Holocaust Survivors and Victims Resource Center at the US Holocaust Memorial Museum, conducted a training on database research for “Remember a Child.” Attending from left: Michlean, Generation After Co-President Anat Bar-Cohen, Board Members Anne-Marie Deutsch, Olimpia Nowicka Sulla, and (back row) Co-President Genie Glucksman. Not pictured is Board Member Dena Hirsh. Board Member Barbara Brandys coordinates Remember a Child. 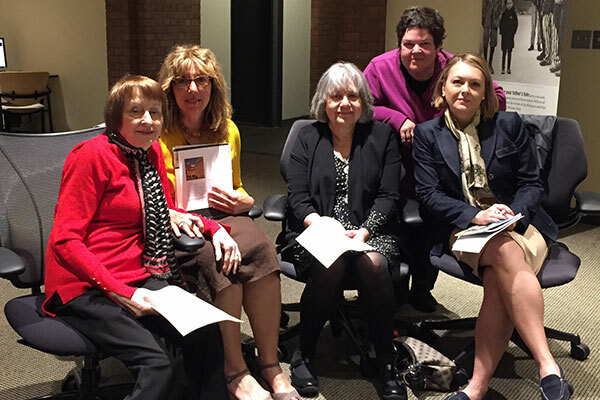 Thirty years ago the Jewish Holocaust Survivors & Friends of Greater Washington initiated a program called “Remember a Child” in an effort to memorialize the children in their families who had not survived the War. There were few, if any, physical remnants of their short span on Earth. The Survivors launched the project to provide pre-Bar/Bat Mitzvah families with the names and limited biographical details of their own young relatives, who had been annihilated before they could become Bar/Bat Mitzvah in their own right. It was their hope that recipients would incorporate these “lost children’s” names into their Bar/Bat Mitzvah. Families received a certificate, documenting this “match” with a young Holocaust victim. Today on-line registries and data bases have enabled the program to broaden its scope. Names of children from many communities and countries impacted by the Holocaust can now be provided to individual families, Jewish day-school and supplemental school educators and synagogue administrators, so that these otherwise “lost” children’s names can be recovered, remembered and respectfully memorialized. Recently the Survivor’s group has passed this wonderful program on to be continued by The Generation After, Inc., the Washington DC group for children of Holocaust Survivors, With our long commitment to Holocaust education and commemoration, we now assume responsibility for implementing the “Remember a Child” program. We will provide key information about the life of the matched child and when possible, will include bibliographic/references, citations, or links to enable families to conduct even more in-depth independent research. The generations can thereby “communicate” with each other and perhaps the tragically curtailed lives of those one-and-a-half million children will inform the lives of subsequent generations. To participate in the Remember a Child program, be matched with a child Shoah victim, and receive a Scroll of Remembrance for your bar/bat mitzvah, please click here. PLEASE ALLOW A MINIMUM OF ONE MONTH FOR US TO RESEARCH YOUR REQUEST AND PREPARE YOUR CHILD’S CERTIFICATE. The Generation After, Inc. is an all-volunteer, non-profit 501(c) (3) organization. Your generous, tax-deductible contribution will enable us to continue to offer this meaningful program. After defraying the expenses associated with this program, donations will be channeled to various organizations that provide direct services, aid and support to needy and aging survivors. We suggest donations in multiples of $18 – the traditional “Chai” – for example: $180, $108, $90, $54.